I lived near here growing up. We would bike there, and around the whole thing, and back home. It has a nice beach, and boat launch area. Campers and Tents can camp there. There are all the hookups you need. My Aunt and Uncle had a nice camper they would stay there a week, and we'd come visit and sit by the fire. You can kayak down the river past the dam to and avoid the other boating area. That's where all the motor boats go. Great family area. LOTS OF TICKS be aware to check yourself and any pets you may bring. Site was nice, hike felt transformative and lake was incredible to jump in after. We stayed at site 17 which is a backpack site about a mile walk in from the nearest parking lot. The walk to the site was on a very nicely maintained trail, however we almost didn't make it there as we were all nearly carried away by mosquitoes. It didn't get much better when we got to our site, as they were everywhere. Aside from the bugs, this was a great site withe a private beach access and great water to swim in on Castle Rock Lake. We didn't really treat this as a "backpack" site and we had enough gear for our family of 6, water toys and other accessories. That was a long walk with all that equipment. For traditional backpackers, this would be a fantastic site, just make sure to bring the OFF spray. 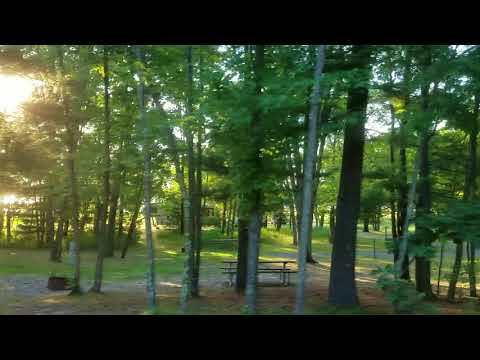 This a small county park in Portage County, camping was $14 per night and was not full. There was shelters, playground and a lake to swim. But the trail to the lake was down a hill, either by stairs or another route. After having fun on the beach, you got to remember you have to go back up that hill with all your beach stuff. Sleeping at night, better hope you use to noise! Highway 10 and the train runs right near this park, so not quiet at night. We had a great campsite that was in the corner. We had our two dogs who normally bark when people walk past but the site was secluded with good tree coverage that we didn’t have any issues! We drove across the highway and got some good hiking in. Really great views! 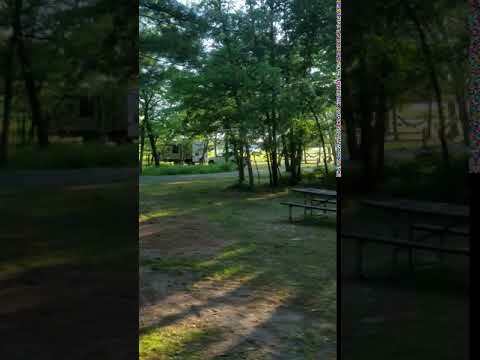 Gorgeous campground in the middle of no where Wisconsin! Perfect place to camp if you like to climb at Necedah! There are a few lake entrances and at one of them we saw a couple large gorgeous cranes! I camped here last summer and wasn't impressed at how close the camp sites were. 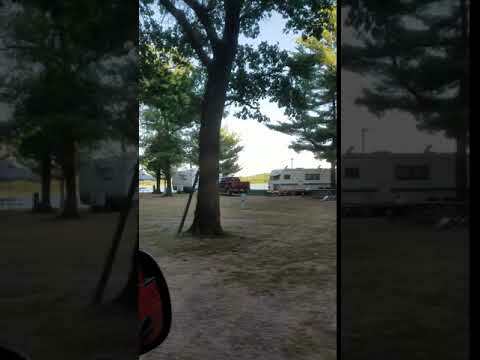 We camped in a tent and there were several RV's nearby. Additionally when we went to hike around the area we couldn't seem to escape the sounds of the nearby highway. Aside from that the bluffs were beautiful and really fun to climb! This is for the Frankenmuth campground. The sites are on top of one another. They do have great activities for kids though. 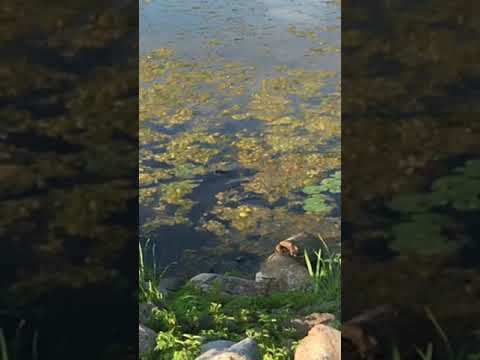 The lake is the clearest and deepest inland lake in Wisconsin. It is non-motorized to promote quiet and clean conditions. Lake Wazee is a popular scuba diving, swimming, and fishing spot.The beach does get crowded with college kids in the summer and is a known party spot. Weekdays and off-season dates are recommended as it is more peaceful. Municipal campsites in the city park, along the Black River and millpond. Safe, clean. Popular with 5th wheel, etc. Fishing, city pool, showers, electric, playgrounds, shelters, and new baseball complex. Wooded, paved trail loop and 26.2 mile Pine Line. The DNR has closed the campground. So I’m driving back from a camping adventure and the wind picks up. After fighting it for awhile we start looking for a spot to stop for the night. One campground was asking $40 or so and that is a steep price for us. We opened up The Dyrt and found this spot. Another camping app had a great review so it sounded like the place to be. The 6 mile drive from the highway winds through farms (hint… one is a pick your own blueberry farm). Turn into the park and the kiosk is right there. If you go right, there is an archery area and 3 campsites. I didn’t see a restroom on this side. There is a short loop hike on this side. The are to the left has a bunch of features. There is a picnic area and playground. Multiple campsites in different areas. There is one by the canoe launch too. Looking at google map, the river is quite curvy. There are restrooms near the back area and by the picnic area. Each site is very large - most with shade and forest. Site 11 is where we stayed. We had no neighbors for a quiet night. Someone left kindling set up in the fire pit and a “bird house” on a tree. For $5 a night, this is a very nice place. I thought it would be a campsite in a field with a pit toilet at the other end. Kennedy Park has a lot of nice features. It’s also pretty close to some local attractions like the circus or Baraboo or many other activities. This was a good stop for us. Truly enjoy a walk in site! Although the site we stayed at didn’t have a lake view, we explored a little and found some sites we want to stay at next time- right on the shore! Hiking paths were great, the check in was seamless and we will be back! This campground has a lot of trees for plenty of shade. There is a little ice cream store where you can purchase treats, cash only. The campsites across from the water are spaced apart well which makes them more private. 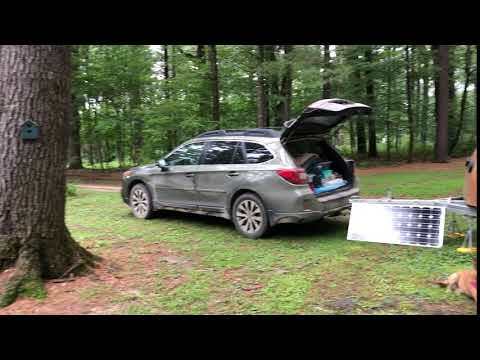 Some sites are tight, so make sure that you drive around the campground before picking a site. ATV parking is at the front. 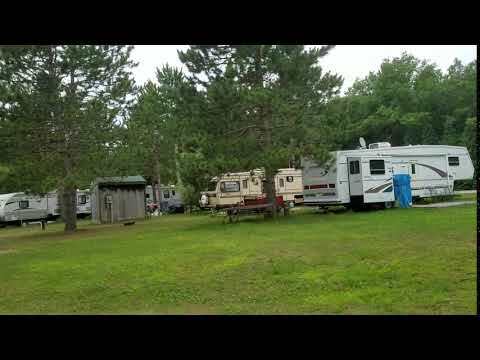 This campground is well maintained, clean. There are showers and recycling bins. The sites are big and the ones on the lake have beautiful views. 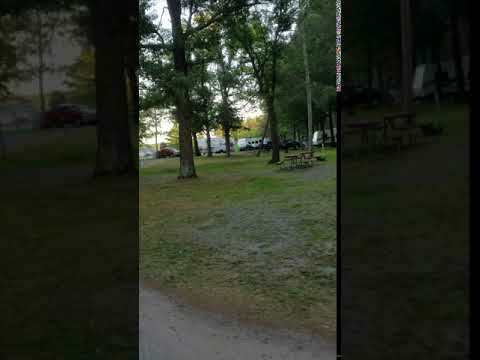 This is a busy campground, a lot of people go there over the weekend. The lake is beautiful for fishing or relaxing. Right now the water is down, and there is no dock at the boat landing. Make sure that you bring cash with if the office is closed people self-register campsites. 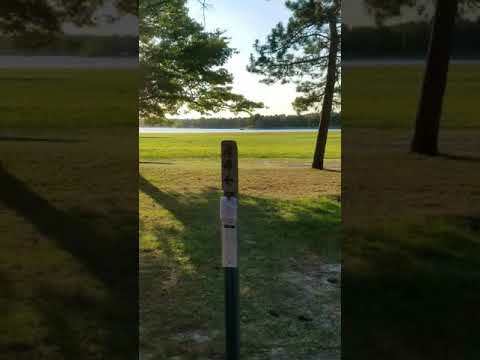 This park is overly crowded with campsites. There’s not much privacy between the sites. 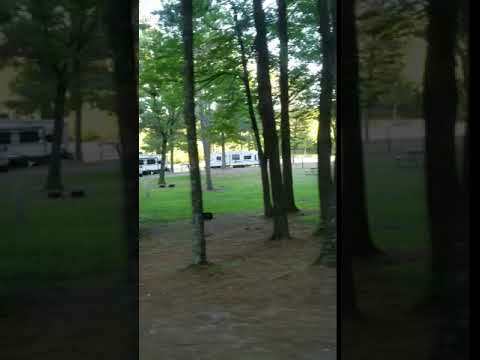 It is very noisy loud and you hear all the conversations from other campsites. They also seem to attract young party crowd and it’s loud through most of the night. The ground was difficult to put tent stakes in as it was very hard. There is great hiking as the Ice Age Trail is part of this park. They do have events for kids on the weekends and some great playground so would be great for families! We took an extended weekend to camp at Buckhorn. There is a bar that has live music close by and you can hear it at night. We were not on the sites closest to the bar so it wasn’t unbearable. We bug bombed the site when we first arrived and didn’t have many issues Friday Saturday. However, Sunday night when there were a lot less campers the biting flies became a problem. They were horrible!! The bathrooms were rather clean easily accessible the showers were clean, private and free- however the water pressure was pretty bad - could only have 1/4 of your body in the water at a time. There are many activities you can do : you can rent bikes kayaks canoes plus it is right on an inlet for the Wisconsin River and there are boat landings etc. There are some hiking trails but they are not overly scenic or require much effort. This campground is a place I have 4-wheeled to many times. The trails around it are well maintained and beautiful. The road to Rock Dam is gravel/dirt.